Mount Elbrus is one of the famous 7 summits, topping the seven continents and consequently suffers from overcrowding. About 2 tons of garbage were taken off the slopes of the mountain by the 3 guys and their Ukrainian Mountain guide Valentyn SYPAVIN during this mission organized in conjunction with Mountain Wilderness. 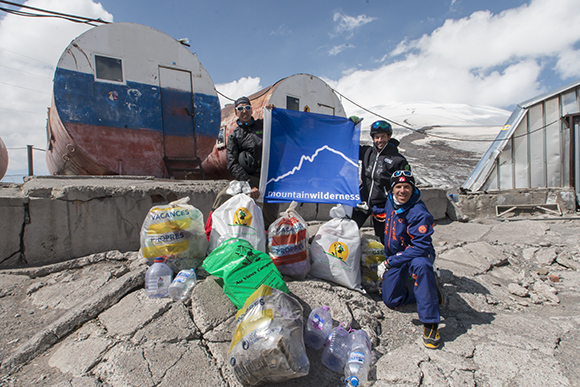 Cleaning the mountain was also a symbolic action to draw public attention to the need to sort and recycle daily waste. The base camp is a vast chaos « made of » obsolete installations and outdated prefab buildings generally hosting local tourists and climbers. For decades all sort of waste has piled up there: cans, food packaging, batteries, as well as remains of abandoned infrastructure (electrical towers, barracks, engines). The team’s presence and determination were so much noticed that they generated a spontaneous solidarity from many climbers of various nationalities and from local guides who decided to join the cleaning crew in their efforts. Upon their return from the Elbruz expedition the team drew a good deal of media attention, several radio interviews and a number of articles have been published. A few partners, as well as the Russian consulate of Lyon have asked for their participation to present the project in Lyon and Paris. TREK Magazine’s reporter Anthony Nicolazzi accompanied the team and took the great photos you can watch here. A « D_VOX production » video of the expedition was put together by Richard Bertholet. Consistent with the team philosophy and action the expedition’s carbon footprint has been measured for compensation with Goodplanet . The money paid offsets the 11 tonnes of C02 emitted by the expedition. Goodplanet (Yann Artus foundation) finances projects for better waste management in the Southern hemisphere.